When looking for blueprints and designs for building your tiny house, the search can be arduous and overwhelming. With all the options on the internet and in books it can be hard to know which ones are worth using. Look for plans that come with detailed instructions explaining how to construct the house, as well as a list of the materials you will need in the process. The corner porch and option for dormers allows for more interior space and a larger loft in this popular Tumbleweed model. Cathedral ceilings, cedar board-and batten siding, and a tiny integral porch off the front, The Gifford was inspired by the Great Lodges of North America and is the design of Four Lights owner Jay Shafer’s home. The tiniest, most affordable home Four Lights offers, The Zinn is 98 sq ft and one of Four Lights easiest models to build. Designed for two people who love to travel. This extremely tiny home has just a 65 sq. ft. footprint—being so small and so light, it’s easy to haul. Still, it has a fully-functional kitchen, shower and toilet, and a loft bedroom for 119 sq. ft. of actual living space. “Tiny house living does not require you to live “tinier than thou, but rather [it’s about] people making their own choices toward simpler and smaller living however they feel best fits their life”. –Greg Johnson, co-founder and president of the Small House Society, 2002. One of Jay Shafer’s highly anticipated larger home designs, The Marie Colvin has cathedral ceilings, a bump out dining nook, downstairs bedroom, and two large lofts. With a downstairs of 262 sq ft and 250 sq ft of lofts space, this model is nearly three times larger than FourLights standard tiny home model. With two sleeping lofts, The Marmara can comfortably accommodate a family of four. This larger home has a bedroom that converts into a living space (thanks to a murphy bed) and a loft with a large window. If the loft is a bedroom, this tiny house sleeps four. Or, two people could live here who want extra storage. Features an expanded kitchen with a fridge/freezer and washer/dryer. With design techniques that can incorporate the use of solar energy, large living space and a front porch, this model is perfect for those looking for alternative energy sources and a little more space. Flexible living space makes up this home with a separate living room that can also act as a guest bedroom and a dedicated dining room to free up space in the kitchen. A large front porch, an open floor plan, and lots of storage components, all in only 226 sq ft. If you want to add a little bit of privacy, a separate area for sleeping and also want to make the most of your tiny living space, a loft can give you just that. And if you want an extra bedroom or more storage space, you can find tiny home designs that have two lofts. This model integrates multifunctional design, space efficiency and light and bright living with a staircase that doubles as a bookcase and storage space, a loft that can accommodate a full size mattress and a total of 11 windows. A 24-foot version of the McG model, the extra space in the MCG V2 allows for a more functional kitchen and a larger living area, bathroom and loft. With 16 windows, space for a queen sized bed and an enclosed porch this model can be fit onto a trailer for mobile use. Very open downstairs and spacious up in the loft, the Linden features Tumbleweed’s new and innovative roof consisting of two dormers, which provides more light and space for the loft and rest of the house. This Elm Tiny House, modeled off Tumbleweed’s first home, features a front porch, lancet window and the option of adding dormers for extra loft space and a cross breeze. With two lofts, one fit for a queen bed the other a twin bed or storage, and 184 sq ft on the ground floor, the Hikari Box offers a spacious and light filled home. 14 windows and 2 skylights give this model its name, Hikari, which means “light filled” in Japanese. All Humble Home plans are designed and checked by a structural engineer. Plans can be downloaded instantly, giving immediate access and no shipping costs. When you purchase a plan you have access to free support and free updates that contain additional options, schematics and add-ons. Humble Homes brv2: Buy plans for $179. All Four Lights Houses plans are available as shell plans or as furnished house plans. Furnished house plans come with a full set of component furnishing plans and access to the blueprints for building the furnishings and room components for the chosen model. Designs offer the option of being built on a trailer or on a foundation. All Tumbleweed plans include designs for the foundation, the floor, the exterior and interior frame and the roof. A material list is provided as well as over 50 pages of detailed construction plans. An engineering section, with speciality construction details, is included to ensure that your house is built solidly. All options come with plans for the roof, the floor, exterior elevations and a materials list. The Full and Everything packages come with plans for the plumbing, electrical, and construction details. All PAD plans consist of detailed interior and exterior elevation drawings, roof framing plans, structural fastener details and detailed trailer connection instructions. Plans come with an option for an energy-efficient design, a suggested floor plan and lots of creative storage solutions. Includes two renderings showing examples of different exterior styles that can be created with the plans. Why pay for tiny house plans when there are designs out there you can get for free? Because many of the free plans available are “use at your own risk.” They may not have been prepared or checked by a licensed engineer and/or architect. With these free designs you will still need to pay for the stamp of approval from a structural engineer (which can cost upwards of $500) before you can even start building. Free plans would be a good place to start if you have design experience and want to use them as a foundation to start drawing on. They can also be useful if you find something you like and want to tweak it a little before taking to an experienced architect or custom builder. The Small House Catalog: The free plans offered at The Small House Catalog are a compilation of designs submitted by the website’s readers as well as from the websites designer. The Small House Catalog is run by Shawn, a boutique drafter and designer, who can draw up custom drafting and design packages. 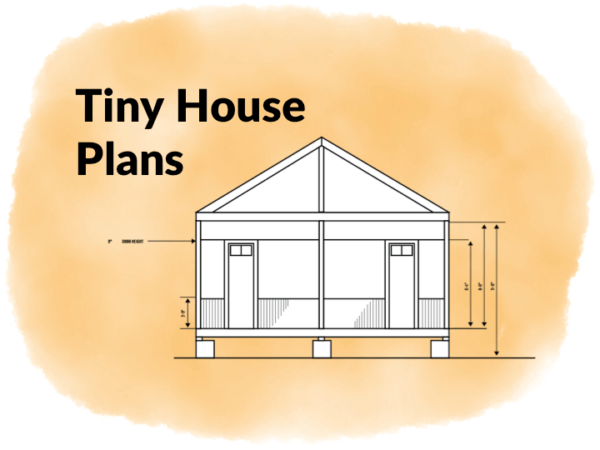 If the responsibility of verifying and executing a tiny house plan seems like too much, consider buying a tiny house kit or pre-built shell. Kits contain all the materials and instructions you need to build a tiny house, one that has been tested by the manufacturer and is structurally sound. Pre-built shells are either shipped to you or erected on-site. Complete kits and shells typically contain all the walls, floors, roofing, doors, and windows. Finishing, furnishing, and electrical/plumbing/heating systems are up to you.